Clayton Whites Hotel is located in the heart of Wexford town, making it an ideal base for sight-seeing, shopping and attending events. We are the closest hotel to The National Opera House and the train and bus stations at Redmond Square, both locations being a leisurely 5 minute stroll away. We are also only 20 minutes’ drive from Rosslare Europort. 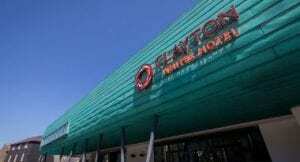 Clayton Whites Hotel is located off the ring road of the N11, N25. In the very heart of historic Wexford town. ● Continue on the M11 to the N11 passing through Camolin, Ferns, Enniscorthy & Oylegate. ● Approaching the town from the N11 you will pass the Ferrycarrig Castle on your left, crossing the bridge, take an immediate left onto the R730. ● Continue along this road, keeping left as you pass under the railway bridge. ● Take the 2nd exit at the Seamus Kelly roundabout & continue on the R730. ● At the Redmond Square roundabout, take the 2nd exit (keeping train station, Sam McCauleys chemist on your left) & then take the immediate left onto Selskar Street. ● Take the 2nd right onto George’s street, at the crossroads, turn left onto Abbey Street. ● The underground car park is situated immediately on the left, adjacent to Clayton Whites Hotel with discounted rates for hotel residents. ● Head for Wexford on the N25 passing through Kilrane, Tagoat & Killinick. ● Take an immediate left after the Bank of Ireland, continue along this road, following it uphill to a small roundabout at Wexford Arts Centre. ● Take the 2nd Exit at this roundabout, Clayton Whites Hotel will be on your right with the entrance to the underground carpark immediately after it on the right with discounted rates for hotel residents. ● At the end of Hill Street there is a small roundabout, take the exit to the right. There is a one way system in operation from here. ● Continue along this road, following it uphill to a small roundabout at Wexford Arts Centre. Clayton Whites Hotel has 250 underground car parking spaces. Discounted rates are available to hotel guests. Bus Eireann www.buseireann.ie and private operator, Wexford Bus www.wexfordbus.com, both stop in Redmond Square with Bus Eireann offering connections to Dublin Airport, Dublin, Waterford and Cork and Wexford Bus connecting Dublin Airport, Dublin and Waterford to Wexford. Buses run frequently and tickets are bookable online.